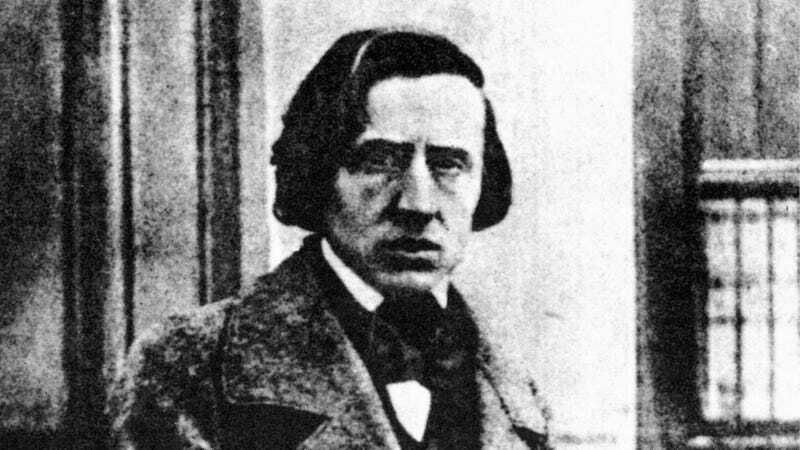 This is exactly what it says on the tin: Frédéric Chopin, extraordinary Polish composer of the Romantic era, upon the event of his death, had his heart reserved inside a jar of Cognac. This glorious nugget of information was found in this fun list from The Drinks Business. The round-up seems to have been inspired by this expedition, which is set to salvage around 50 bottles of wine from a shipwrecked British cargo vessel torpedoed by a German U-boat in 1918. The list covers “remarkable drinks-related discoveries,” and it’s a great, great read, but man, Chopin’s boozy floating heart is the winner of the pack. The book doesn’t detail the booze, but Atlas Obscura also says the spirit was “most likely Cognac.” The heart went back to Warsaw, but the body was buried in Paris. During the Warsaw uprising in 1944, his heart was removed by the Nazis and given to the S.S. officer Heinz Reinefarth. It was subsequently returned to the Church of the Holy Cross in Warsaw in 1945, where it remained until it was secretly exhumed in 2014. Photos were then taken of the heart. The exhumation wasn’t nefarious, though it was apparently quite the covert affair. It was intended to make sure that the jar hadn’t cracked, so that the Cognac could keep on working its magic to keep that heart fully alcoholic. Atlas Obscura has a piece on that, too.